Walker and Company, New York, 2009. 311 pages. After Savannah gives her brilliant older sister Jane a makeover, Savannah's boyfriend suddenly sees Jane's charms and takes up with her. In Savannah's despair and sorrow, she gets a visit from her fairy godmother, but unfortunately learns that her fairy godmother is only fair at the job. In fact, she seems a bit hung up on fairy tales. Savannah learns that life as Cinderella or Snow White is not much fun. Then she thinks she makes a wish that can't be twisted -- and ends up stuck in the Middle Ages until a nice guy from school can make himself a prince. Well, several chapters further on, I was able to drum up some sympathy for Savannah. I must admit I'm not sure she didn't deserve a few weeks as Cinderella, but she got them, and they did their work. 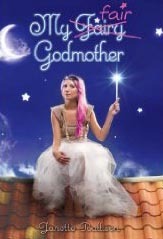 Mostly, the author does a grand job making a delightful mess of fairy-tale situations and magic and the meaning of love. Then I had to explain to Jane and Hunter how my fairy godmother had misunderstood certain statements I'd made and had sent Tristan back in time to become a prince. He still had two tasks left before he could achieve that goal and return to our time. "Kill a dragon?" Hunter said as though he both envied and feared for Tristan. "Can you do that?" Jane shook her head, disbelief seeping into her tone. "But your leprechaun told us that all you had to do to come home was to ask your fairy godmother." "Oh, well, that just means you were duped by a leprechaun," I said. Hunter cocked his head and looked at me narrowly. "Your fairy godmother won't help you at all?" "My fairy godmother won't even take my calls. She's sort of a teenage, airheaded shopping diva who didn't pay attention very well in fairy school." Jane sat down on my bed and rubbed at her forehead wearily. "Well, that figures." I followed her with my gaze. "Meaning?" "They must match fairy godmothers to people by type. You pretty much just described yourself."